We are encouraging customers to switch to our new configuration for our RPC desalting MiniSpin columns, BioPureSPN, for additional sample capacity and reproducibility. The BioPureSPN PROTO C18 MACRO (HMM S18V) contain the same wide pore C18 that is in the MACROspin C18 (SMM SS18V) columns (100mg vs. 89mg). The BioPureSPN PROTO C18 MIDI (HEM S18V) contain the same wide pore C18 that is in the MicroSpin C18 (SEM SS18V) columns (50mg vs. 38mg). The BioPureSPN PROTO C18 Mini (HUM S18V) contain the same wide pore C18 that is in the UltraMicroSpin C18 (SUM SS18V) columns (20mg vs. 18mg). The FastEq BioPureSPN C18 MACRO (HMM S18R) is a water wettable chemistry which equilibrates 10x faster than other C18's. It is the same TARGA C18 chemistry as is in the SMM SS18R columns, and is designed for impatient researchers or very polar molecules which need to be loaded in 100% water onto a column fully equilibrated at 100% water. The extra packing provides greater assurance of binding from higher volume loads, but doesn't impose a volume penalty for elution since one spins these "dry." One can use exactly the same protocol currently used, with the assurance that this new package design will provide additional protection for one's samples. They are color coded by chemistry for convenience and are storable. Packaging options are at BioPureSPN.shtml. UltraMicro™ Spin Columns are available in RPC solvent resistant housings for purification of small samples (3-30µg). UltraMicroSpin Columns offer a wide variety of packing materials including gel-filtration (no sample capacity, and they have sample volume limits), ion-exchange, silica based reverse and normal phase materials. Additionally, specific application materials like HILIC for detergent removal, HIL-SCX for post ICAT sample prep, ERLIC-WAX Phosphopeptide Enrichment, and TARGA® C18 for desalting of phosphopeptides and carbohydrates using 100% water loading conditions. Empty columns are available so your proprietary packings materials can be used in this format. UltraMicro Spin Columns have a collar for microfuge centrifugation. Packing bed void volume is ≈18µL, with sample elution volumes of 15-30µL. Use these columns with centrifugation, vacuum or pressure to solve the most demanding desalting problem for your protein, DNA, or carbohydrate. The recovery is reproducible and there is almost no sample loss. PAGE*Eraser™ microFilter Spin Columns remove particulates from samples from in-gel digests to prolong capillary LC-MS column life. MACROspin columns have a packing volume of ≈190µL, suitable for 50-150µL sample volumes for desalting by SEC (limit sample volume load to <100µL), or desalting by partition and elution with larger volumes. 96-Well Spin Plate are now formated as both MiniSpin and MacroSpin plates to bring speed and simplicity to the parallel processing of microSPE. Micro-pipettors are not recommended for use with Micro Tip Columns (columns without the attachable collar). Sample can be applied either by application at the top of the column or by suction through the outlet of the column. However, using a micro-pipettor to cycle the sample up and down through the bed can displace the frits, allowing packing material to pass into your sample. Additionally, excess volume may elute early eluting components so desalting results will reflect sample composition since longer eluting components can displace weaker bound components. Care must be taken to limit the number of cycles of sample solvent loading, since elution of sample can occur when more than seven bed volumes are employed for loading and wash. Additionally, the rate of solvent loading and elution will affect the ability of one's sample to diffuse onto or off of the bed. For these reasons, we prefer the use of MiniSpin columns rather thanTips. However, there is the convenience factor that a Tip offers, which we cannot deny. Detergent Removal: Use HILIC MiniSpin columns for complete detergent removal. 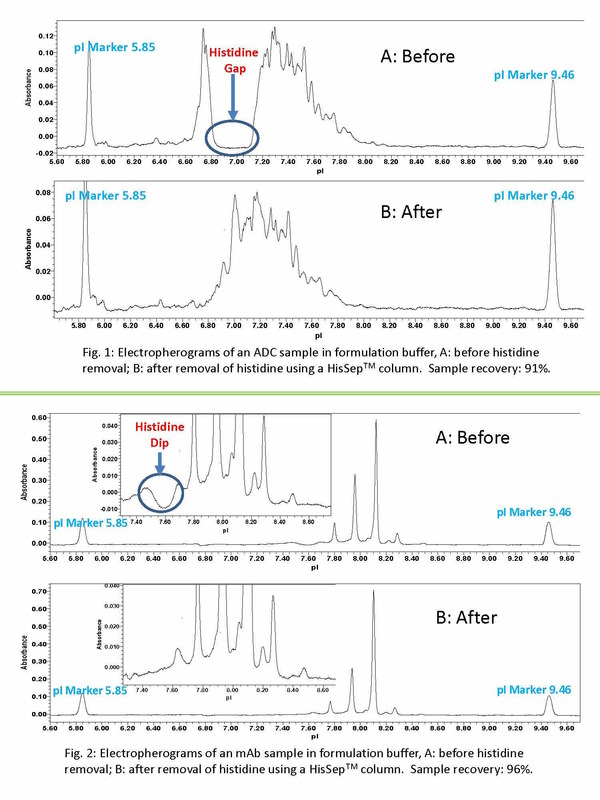 Histidine Removal: Use HisSep™ Spin columns from ID Biologics replace membrane techniques for complete histidine removal from antibody formulations. HisSep™ columns increase the accuracy of assays by removing the interference of histidine in amino acid or icIEF electrophoretic assays. Six-Step Method Development for Robust Solid Phase Extraction Results. 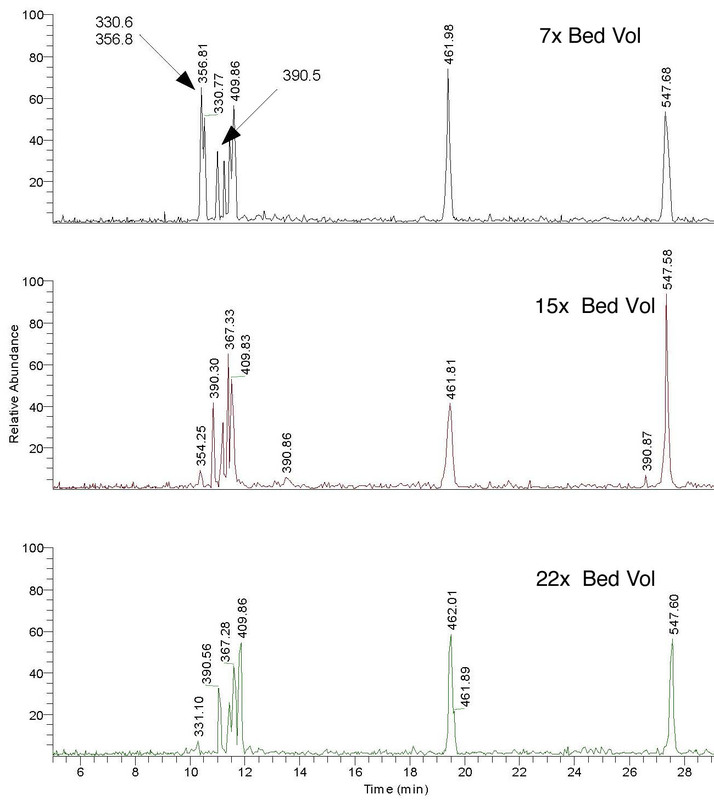 (A) A mixture of BSA (MW 68,000) and Vitamin B-12 (MW 1355) shows two peaks in HPLC - Chromatograms after sample preparation with UltraMicro-Spin column (Sample Vol. 20µL). (B) After centrifugation with G-50 (size exclusion) spin column, the smaller molecule (Vitamin B-12) is retained and BSA is eluted. This MiniSpin column can be used for the removal of small molecules such as salts or primers from oligonucleotides. (C) After centrifugation with a C-18 (reverse phase) MiniSpin column, BSA is retained and Vitamin B-12 is eluted. This column chemistry can be used for the analysis of small molecules after the removal of proteins or large molecules as would occur in plasma samples. (D) After centrifugation with a Silica (normal phase) MiniSpin column, BSA is eluted and Vitamin B-12 is retained. This column chemistry can be used for the analysis of small as well as large molecules. By using different eluents small molecules can be eluted from column after removal of large molecules. See MiniSpin Columns and MicroTip Kits for Part Numbers and Prices.